“This is It” documents the last days of pop star Michael Jackson as he prepared and rehearsed for his extravagant 50-show farewell tour. There isn’t a single person alive that can’t find at least one Michael Jackson song that they enjoy, unless said person is not a fan of music in general, of course. This simple truth is a key ingredient in the star’s post-humus release, “This is It,” where the rehearsal footage of his upcoming 50-show farewell tour is paired with fan interviews and behind the scenes footage to give an intimate, and not always glowing, image of the star days before his death. Is it a fitting tribute, or was this not the way the King of Pop’s legacy should have ended? 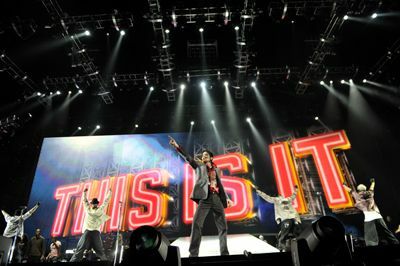 There isn’t much of a narrative to grasp in “This is It,” but the documentary manages to maintain interest throughout by keeping an anticipatory flow as the songs being rehearsed become more and more recognized and popular as the runtime continues. Audience members will find themselves fighting the urge to sing along to their favorites, and many will surprise themselves with how quickly they can recognize Michael’s number one singles, making the film a successful, if watered down, concert experience. Occasionally, Jackson’s eccentric personality brings out the oft-parodied, soft-voiced, man-child within. But these brief stumbles into comedy are rare and quickly forgotten in the heat of the back beat. Towards the end of the film, the star’s over-simplified morality muddied the flow slightly, but for the most part Jackson comes off as a dedicated perfectionist, if an overly kind one. Rather than slapping together a two-hour music video, the stage excerpts are broken up by the aforementioned interviews and behind the scenes segments, all of which combine much better than anticipated. It’s a testament to Michael’s star power that half a film can bank on footage that most films would hesitate to include in DVD special features, like the banter between star and tech crew, which is shot surprisingly well, with intimate, often hand-held cameras. While definitely not an exciting buffer between the high-energy stage sequences, there is enough interesting footage to keep most audience members’ attention. The only concern that is impossible to fix is Michael’s almost inaudible voice, which is forced into subtitles that break the cheery back-and-forth between crew members. The interviews are by and large the film’s most tepid moments – the overzealous fandom often coming across as more of a case for Michael Jackson to become God than anything else. Most crew interviewed have only a passing cameo during their adjoined stage footage, making their brief appearances come off as irrelevant and obvious padding. It’s recommended that you just nod your head until it cuts back to Michael on stage, because listening too closely is most likely to cause idol worship. Exception must be paid, however, to the show’s female lead guitarist, whose interview acts as a bookmark for a couple pretty epic solos. All becomes irrelevant when the camera cuts back to Michael, as the main attraction is the show as envisioned through his eyes. Thankfully, Jackson’s tendency towards over-preparedness ensures that many numbers – especially the most fan beloved – are as close to performance as possible without a daily $20,000 lighting and pyrotechnics tab, background dancers and all. Many performances are sewn together between two or three different takes, but are synched relatively well through a mix of three-panel shots and close cuts that bridge between each day’s choreography. The bridging is done to keep a higher tempo of energy, Jackson’s own noticeably ebbing from day to day, and they serve their function well. What couldn’t be shown is represented by quick computerized models of what could have been, and they round out their numbers decently, and do not interfere with their songs when used. If fault is to be found in the rehearsal segments, it’s in the rarely obvious shifting between Jackson’s recorded vocals and actual on-stage singing, the difference between the two being especially staggering when changed in the middle of the same song. Again, the incidental nature of the film-at-large acts as a reasonable excuse for most of these issues, so complaint beyond a certain point is pointless.